Here we are, finally in South Africa, the final country of our outward journey; after are few minutes we carry out all the formalities necessary to enter the country (there is even an electronic fingerprint reader). There is no need to show the visas here; they stamp our passports valid for three months. We are still driving on the left-hand side. 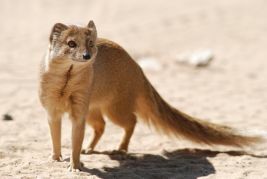 We travel through an ever-steepening desert landscape inhabited by friendly mongoose. 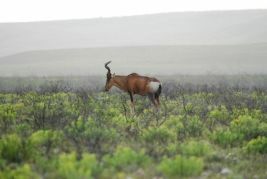 We arrive in the small town of Springbok. The price for the internet is an unbelievable 6-euro (£4) an hour! We buy 10kg of motor oil so I can change the filter and engine oil. We lodge at Caravan Park, which is nice and clean. In the last few days, once the sun goes down, the temperature drops dramatically. Tonight was three degrees Celsius! 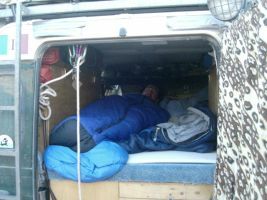 We decide to change tactics and so we start sleeping inside K7. 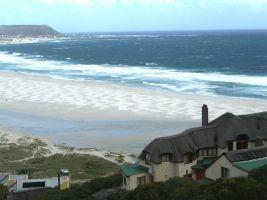 We take a course along a beachside that leads us to the bay of Groenrivier. Here, squatters have settled with there sheds. Along this government coast, they have illegally built these wooden holiday homes. 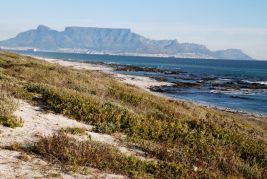 An elderly gentleman shows us the way to a track that skirts along the coast for a few hundred kilometres. The beach is to our right and the desert to our left. However, it is a bit late now; we are here, so we might as well just carry-on through. In this town full of fishermen the rain can be a nuisance. Instead of a braai, we opt for a go to a fish restaurant. 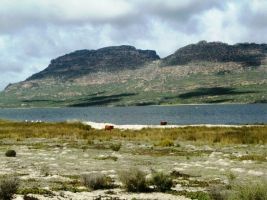 The landscape in this area of the Olifant River is unique. Intense flashes and bolts of lightening dart and skip across the horizon illuminating the sky in an amazing magical display. Join us on this journey to the Western side. On this peninsula there is a deep fjord creating a natural shelter. Here, the first Portuguese navigators, at the end of the 15th century (Cao, Diaz, Vasco De Gama and later Magellano) made the most of this natural port that must have appeared to them a wonderful oasis after many months in the cold upon the rough foggy sea. Animals now enjoy this tranquillity, as well as the many yachts and pleasure boats. 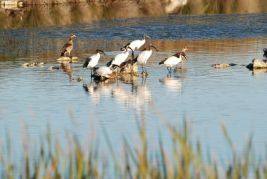 Many types of birds, some migratory, make the most of these calm relaxing waters as an ideal breeding ground. 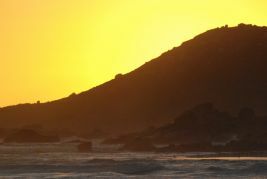 A pleasant atmosphere; a mix of Sardinia, California and the coasts of Liguria. 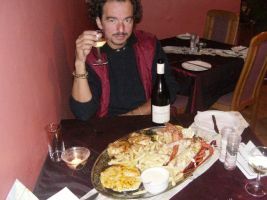 At midday, the warm winter sun, prompts us to take a break in a lovely restaurant for a ‘taste’ of the local fresh fish and some fruity white wine. 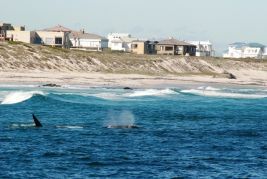 During this season, it is often possible to see whales surfacing. We sit down on a bench under the warm sun and watch two playing. 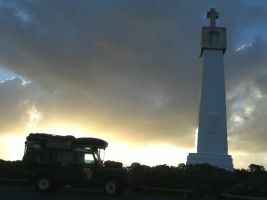 After 7-months we arrive in the city, which for many overlanders is their destination; Cape Town. 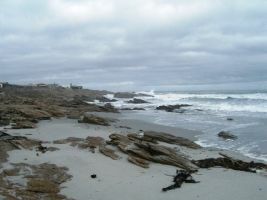 We are about halfway through our journey, although, halfway is really further south, in Capo Agulha. For centuries, the unmistakable profile of the mountain that this city was built around, has gladdened many a sailors’ heart, they found shelter in this bay after many months navigation on the open seas from Europe or the Indies. Like many before us, we decide to take a break and rest for a few days; we visit this beautiful city and take advantage of our time to “sort out some things”. There have been some strange noises coming from K7’s gearbox since Angola. 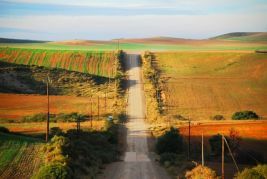 In whatever gear, as the RPM increased, the noise would start, and then, as we reached a certain speed – different in every gear – the noise would stop. Not a particularly loud noise, but it was worrying. We contact a gearbox expert and for couple of days, we leave K7 in his hands to see whether the problem is serious or not. 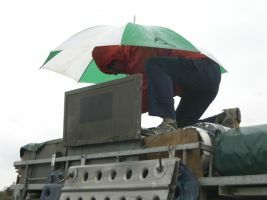 They will remove the reducer and gearbox to try to diagnose the problem. Meanwhile, we’ll live the city on foot. 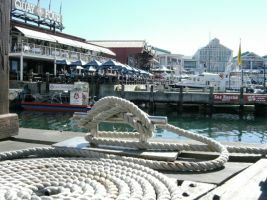 The port is geared-up for tourism and nevertheless, it is enjoyable. 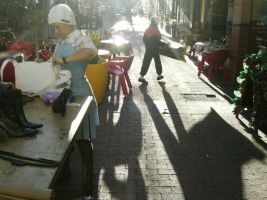 For a few hours we delight in the music, the street shows, souvenir-shops and shops were one can try fresh fish at a reasonable price. 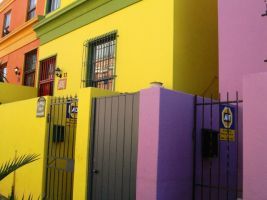 The coloured houses next to the Muslim neighborhood lend a touch of cheeriness to this part of the city that is situated on the hill of the cannons. 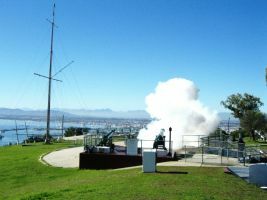 A cannon is fired every day at noon from this hill and has been a tradition that dates back to the end of the 1700’s when it was once an indispensable procedure for sea-captains; they would regulate their time and calculate how far they where from land. Today this tradition serves only the tourists and in particular those that simply like to ‘hear’ when it is midday. 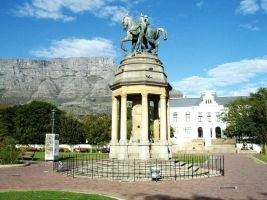 The Dutch founded this city in 1600 and it is the first European settlement in South Africa. At the end of the 15th century the Portuguese (Dartolomeo Dias, Vasco De Gama) had already been here, but it seems they were not that interested; they much preferred St. Helena and the coasts off Mozambique. Centuries later a shipwreck lead to a group of Dutch survivors living here for a year before they were able to return to their homes. 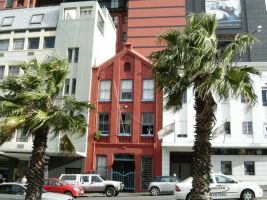 Consequences of this involuntary residence changed the views of many on the usefulness of this location; a Dutch Company in the Indies, created a colony just so they could service their passing ships. 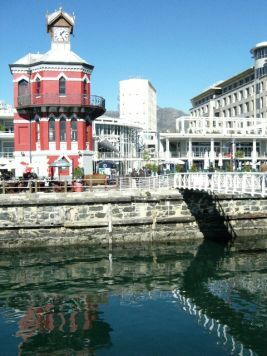 Halfway through the 17th century saw the development of the port and the city. 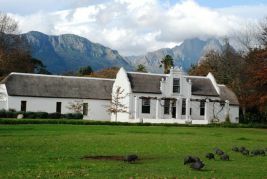 The first proper inhabitants were Dutch, followed closely by Huguenots and French refugees from Holland; subsequently, the Boers came about; farmers, rough colonies coming to grips with a hard life of conquests. 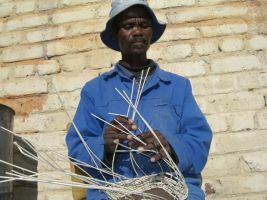 The local indigenous population - the Khoisan - was not so easy to subjugate and so slaves were ‘imported’ from the Indies. 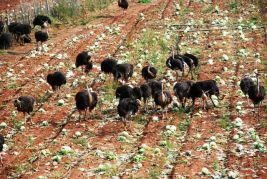 Over time, the gradual integration and coalescence of these peoples have created a characteristic and ‘colourful’ population. We go to the Italian Consulate to apply for new passports; we have nearly filled all the pages, so we will need new passports if we want to finish our journey. To get a passport can take up to twenty-days, therefore we decide to commence with the formalities here pick them up in Pretoria where we should be in August. They tell us to begin the formalities directly with the office in Pretoria and so we need to forward the application by email. 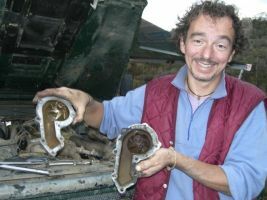 Our gear expert has diagnosed the need to replace some of the gears and bushes; he orders the parts from Johannesburg but they do not arrive. 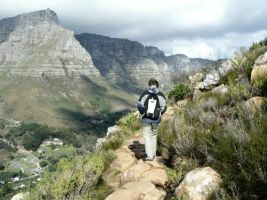 A further three-day wait, in the meantime we decide to take an excursion to Lion’s Head. This mountain, 669metres high, is right inside the city and it divides the coast area from inland. The panorama and aerial views are spectacular going up the mountain; chains along the very steep sections help to make it easier and safer to reach the summit. However, the wind is blowing at 100km/h, making the climb rather ‘interesting’. 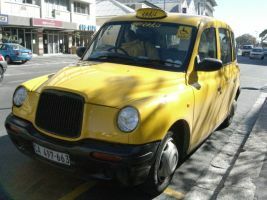 To move around the city there are sharable (London) taxis called Rikkis. They are more colourful and cheaper than normal taxis. 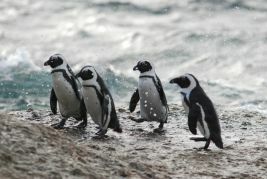 We find accommodation at the economical and comfortable Zebra Crossing guesthouse. The internet and cooking facilities are free. 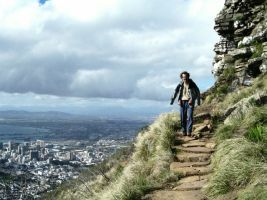 From the city, we begin our climb up Table Mountain. 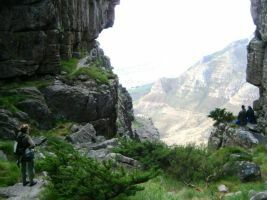 The flat summit, at 1086m, and the steep slope across the gorge Platteklip footpath are thought provoking. We need to be back before 18:00 for safety reasons. After a five-day delay, they finally finish working on K7. 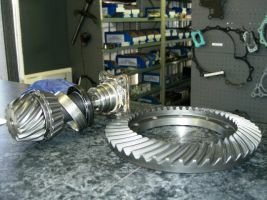 They were supposed to replace the bushes, instead they changed the pinion and the crown on the front differential; the gears were not particularly worn-out so they had assumed the noise was coming from elsewhere. Furthermore, they do not explain to us why we could hear the noise with the gears engaged when the car was standing still! 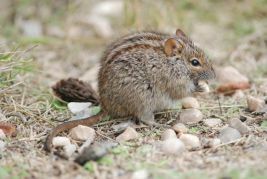 They add to our mounting frustration and dismay with a bill, totalling some 800-euro (£650). A bit stiff, to say the least, especially when we are still less than convinced that they have completely solved the problem. We shall put the K7 to the test once we are up and running; then we will see if the noise has really gone, as they have assured us. Ah well! This after all, is part of Africa! 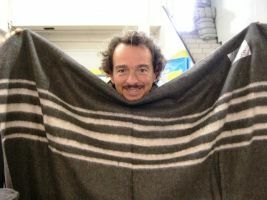 We buy some very cheap blankets. We will take them with us to Namibia, where we will donate them - along with the clothes the runners in the “100km Namib desert” will be bringing - to the Dreilinden orphanage in Okangwati. 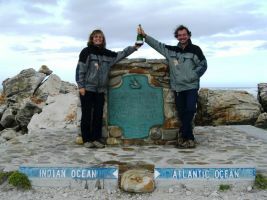 We leave Cape Town and head towards the most Southern point of Africa. Grand beaches and a calm sea. 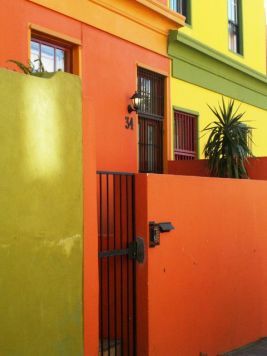 Strange houses crossed between Dutch and African. Sloping roofs made of straw, as if to rid the piling snow (it has never happened). 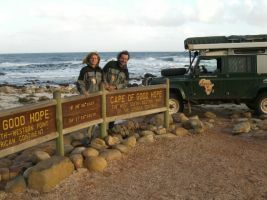 Here we are at the Cape of high hopes! 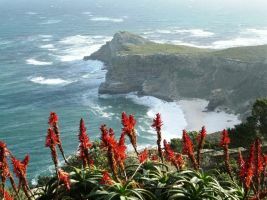 Still, this is not Africa's most southerly point; however, because of the coast’s shape that forms a large, calm gulf, many consider it the division between the Atlantic Ocean and the Indian Ocean. It was in 1488 when Dias, left Lisbon with three ships (today, more akin to boats than ships), rounded this cape, during a violent storm. 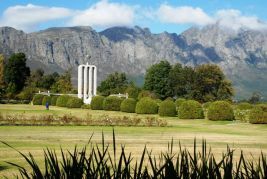 He had already reached the coasts of Namibia and had stopped-off at the gulf that a century later would become Cape Town. This is his memorial stone, erected in sight of Vasco De Gama’s, who had followed him ten years after to reach the Indies. 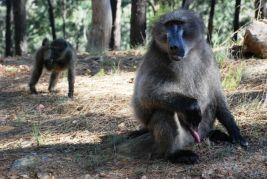 Baboons inhabit the whole peninsula; however, today their numbers have reduced significantly, the current population has become a protected species. We stop and camp at Miller Point, a nice place by the sea. 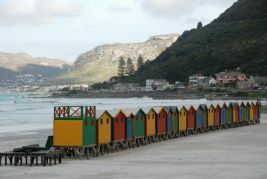 We follow the coast all the way to this little seaside-town full of surfers and famous for its Victorian bathing cabins. 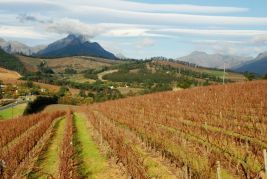 The wine tradition arrived here from France via the Huguenots. When they came here as refugees to escape the religious persecutions of the Catholics, they were welcomed by the Dutch and became farmers, supplying the ships of the Dutch Indies companies (the VOC) with fresh goods. This country reminds me of France in many ways, there is a monument, and an interesting museum dedicated to them. 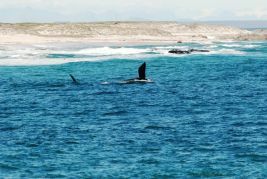 During this season, it is very easy to spot whales, and our visit does not disappoint. 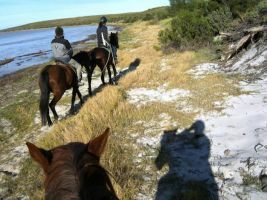 We make the most of it and take a jaunt along the coast on horseback. This coast is always dangerous for ships that round the cape. 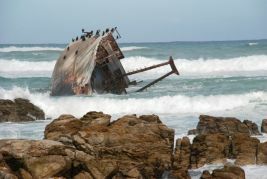 We hear many stories of shipwrecks and survivors and with wreckages in evidence, its clear to see why this is a legendary place in the history of navigation. 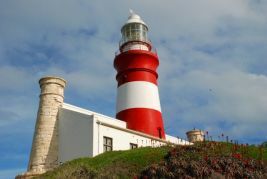 Here is the most southerly lighthouse in Africa. 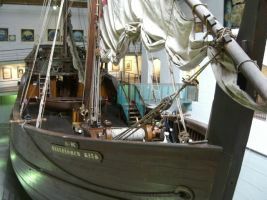 It is also its second oldest - built in 1848. Inside, there is a nice museum on the lighthouses of the world. 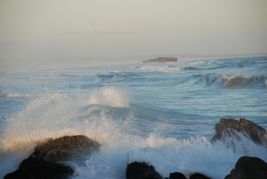 HERE WE ARE AT THE MOST SOUTHERN CAPE IN AFRICA!!! THE TURNING POINT! – Let’s make a toast! 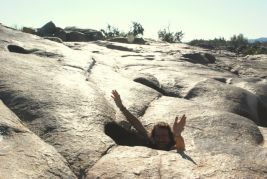 From this point onwards, the only way is up; it is the turning point of our journey. We are below the equator at a southern latitude that, on the northern latitude is the equivalent to Sicily. 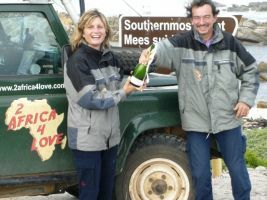 We celebrate with a local Champenoise with our trusty K7! 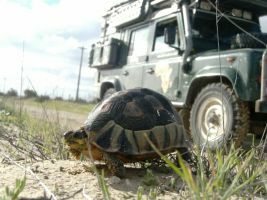 Now we will start to go slowly back towards Namibia for our appointment with our friends in the “100km Namib Desert Run”. Halfway through our journey, after 33,000km we stop to check out K7’s tyres. This is a photo of the Michelin XZL 7.5 R16, which we have been using on our journey so far. This is the front wheel, and they are both still in good nick, so far we have never needed to change them. The rear tyres wear out sooner because they have to sustain a heavier weight and we have been alternating them with the spare wheel. 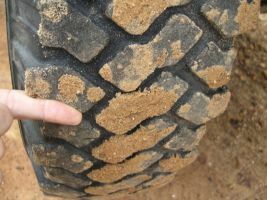 On asphalt, the tyres are a little noisy and the tread tends to wear quite quickly. They are extremely robust on ice and rocky roads. Unbeatable in mud or on dirt tracks with a slippery surface. 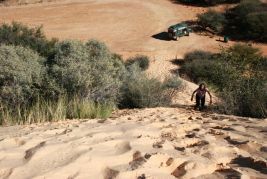 They are not very good in the sand, but if they have been deflated enough, they are better on sandy tracks. At 110euro/£80 each, they are reasonably priced and are readily available almost everywhere, from Senegal to Dakar, from Gabon to Libreville. 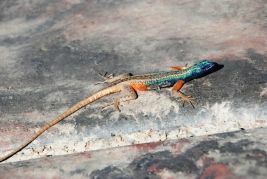 However, they are almost impossible to find in Burkina, Ghana, Togo Benin, Nigeria, Cameron. 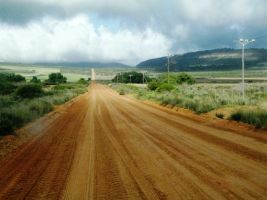 Choosing the kind of tyre to use to cross the western part of Africa depends on the period one intends to cross. In this instance, judging by the period in which we crossed, the all Terrain tyres by Goodrich could have been better for us. The sections between Nigeria and North Angola are key to deciding, but probably more so between Cameron and Gabon. In these states arriving early or late means the difference from driving in a sea of mud or on hard rocky roads. We are satisfied with the careful decision we made; we do not fear the heavy downpours. 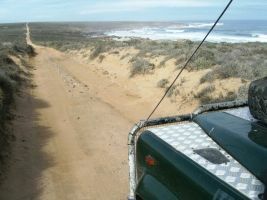 One has to keep in mind that travelling alone and getting stuck in the mud with such a heavy load is less than ideal, furthermore, with or without the right tyres a normal vehicle like ours is not ideally suited to travelling through dunes, therefore, we always try to avoid them as often as is possible. 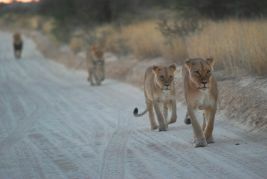 In two months, after Namibia and Botswana, we will have to buy some new tyres for the journey back. 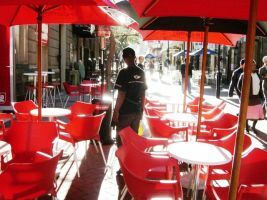 We will see the choices South Africa have on offer. 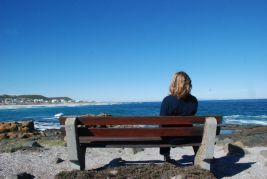 This park, by the sea, is very pleasant. 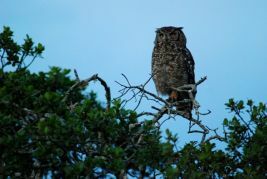 A magnificent owl welcomes us; maybe he has a message for the wizard? 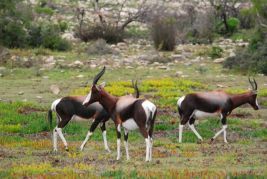 Here we can find the rare but protected Bontebok. 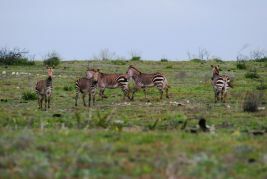 …and the mountain Zebras, they differ from their more common ancestors because of the stripes on their buttocks and a redder face. A change for the worst, bad weather and the alternator warning light is on. We stop straight away by the side of the road. Under the bonnet, the fan belt has wrapped itself around the fan. The water pump pulley is loose and resting on the side of the engine compartment. I try to refit the belt so we can continue and reach a mechanic, but it will not go on, I try hammering hit but without success, it won’t go on fully. I quickly consult Sorbara on our satellite phone, and my “master” mechanic McDaniel in Italy gives me a few ideas. I search for the spare pump amongst the spare pieces I have brought with me and once I find it, I proceed to remove the old one. Three cars pull over to see if they can lend assistance. First, a drunk that is so determined to help, but fortunately after half an hour he gives up and drives off. 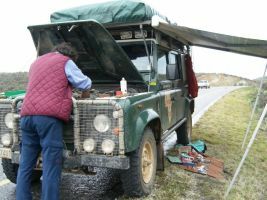 Then, a chap in a Land Rover stops and asks us if we need help but he can see I have the situation under control, he too drives off. Finally, a local man stops and offers us hospitality in his courtyard, a safe place to sleep just in case we should be here for a long time. 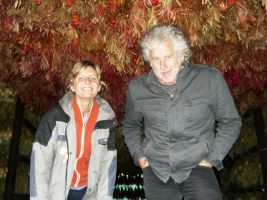 As it happens, we do end up taking a very long time and so we are guests of Willem and Joenne. They produce lovely dry flowers that are exported all over Europe including Italy. The following day they show us the drying-room full of “protee”. 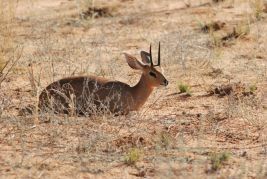 Here, we see the “Red Heartbeast” as well, closely related to the ones we saw in Namibia. We are back near the ocean along the same beach that Dias had reached, exhausted and where he found water, before returning to Portugal. The museum here is dedicated to him. 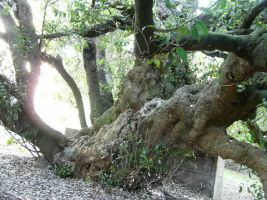 The sailors that were heading towards the Indies used to leave their mail here by this age-old tree, which was then collected and taken back to their native land by ships that were on their return. 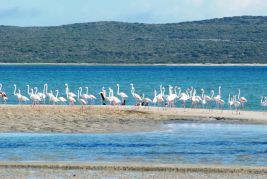 They say that the lagoon in Knysna is extremely beautiful. Grand and full of charm, a narrow recess in the hill separates it from the sea. It wouldn’t seem that bad… if it wasn’t pouring down and if the campsite had a shelter where we could grab a bite to eat without spending a fortune… then maybe we could appreciate it more. Luckily, there is a great pub where they cook a marvellous chicken-liver soup, but not so marvellous are the four pints of locally made Mitchell beer we order. A wise rule: never drink too much beer before bedtime, especially when your camping inside or on top of a Land Rover whilst outside it’s raining cats and dogs… and the only loo, is a 100m dash! In the damp weather, we carry on north towards Oudtshroon, the land of ostriches. 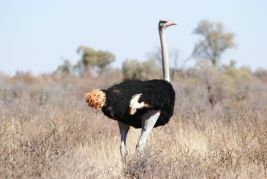 Many centuries ago, many people made a fortune here with ornaments and hairstyling using ostrich feathers. 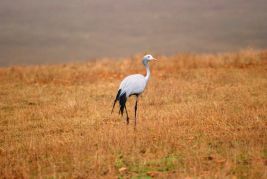 Today, it is not just their feathers but also their meat that is popular, and so the “fortune” continues. 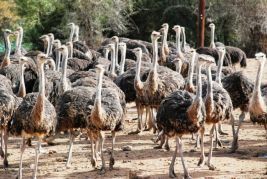 It’s big, clean, well equipped and the dinner, based on ostrich, is very good and cheap. The waterfalls fall some 67meters; you can reach them, with suitable kit by a short pathway. 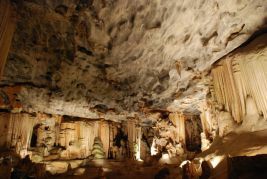 These splendid caves are found on the road heading north; some of the itineraries are very adventurous. 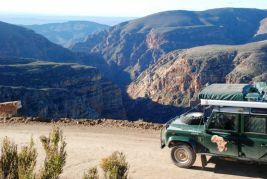 At over 1600meters, this old passage between the Desert Mountains of Karoo has a breathtaking panorama. 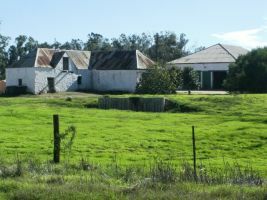 It was built with great difficulty in 1881. 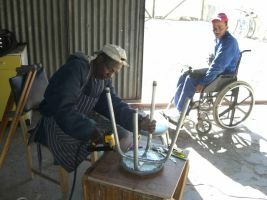 After having seen the Karoo park and its “usual” gazelles, we decide make a little diversion to visit the Werkswinkel community, where handicaped people fabricate products, repair furniture and fix shoes. We leave a 80euro (£50) Elfo token. Details in solidarity. 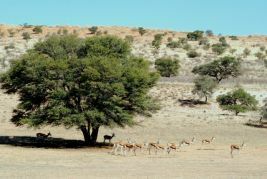 After the Swartberg Pass, the landscape quickly transforms into a desert bush with sheep everywhere. 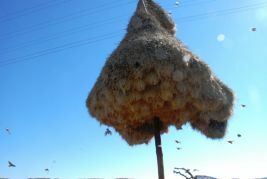 On electric poles, the Tessitori birds find the only place they can build their communal nests. Sometimes, they are so heavy that the poles actually fall down and sometimes, dampness from the humidity and the heat of the sun cause them to catch fire, creating many problems for the maintenance workers. We are happy to recommend the place we stayed overnight in Britstown, the Guest House Mirage, GPS S30°35.259’ E023°30.297. 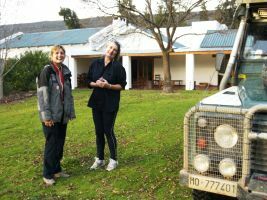 They are very kind and friendly and they allowed us to camp in their courtyard and use the kitchen and the bathroom. We are heading towards the most spectacular desert in the world (Namib) in Namibia, where we take a diversion for150km to go and see some beautiful sand dunes! The real reason why we have come here, is to hear “the roar” that can be heard from the sand and the wind. 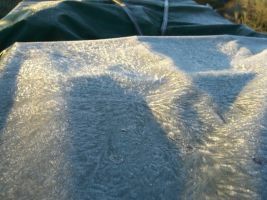 Unfortunately, this unusual phenomenon only occurs when it is dry during the summer in January. Now the dunes are silent. We spend the night in Upington at the Sakkie Se Arkie. 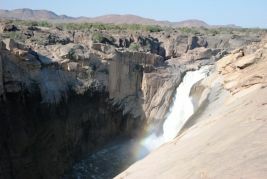 It is cheap and situated in a nice place along the Orange River. 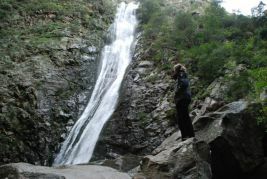 It is truly beautiful with two spectacular waterfalls, gorges and canyons. 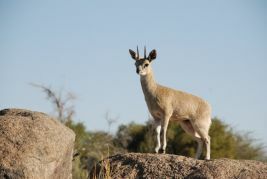 …and the rare and timid Klipspringer, a kind of small antelope, can be seen very often. …and a great number of multi-coloured birds. 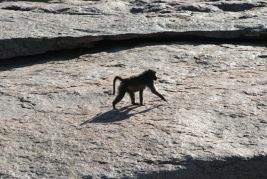 Trekking for three and a half hours amongst baboons brings us to the remote waterfall and to the moon-rock. Cylindrical holes as deep as a person is tall. 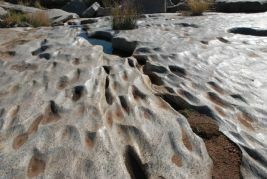 The flowing water has formed the uniquely strange shape of the rocks. 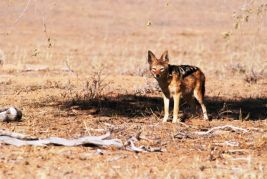 On the southern edge of the Kalahari Desert, the border with Namibia and Botswana territory, this park is accessible from all three. At the entrance to the park, as well as the park rangers, there is also a customs checkpoint. A step forward has been the collaboration of these countries in the “Parks for Peace” project. 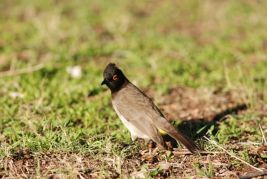 It is a very natural park, which is situated between two rivers. 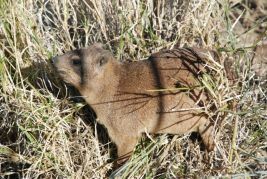 A track runs along the banks and the animals live inside; however, there are no worries! 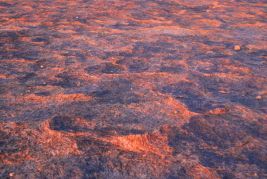 The Auob, only fills with water every 12 years and the Nossob, on the border of Botswana, only has water three times during a century. The temperature during our excursion is very high, during the day, we are in short sleeves, but during the night… it’s freezing! 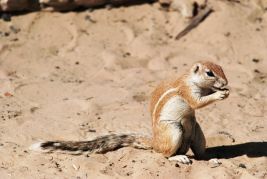 The Northern part of the park is much better for seeing animals. 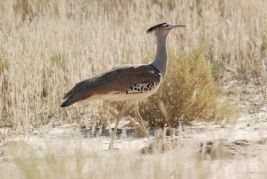 The largest flying bird is the Kori Bustard and the fastest running bird is the red-tailed Ostrich. 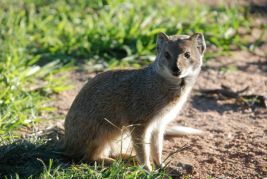 The flitty Yellow Mongoose - a snakes’ nemesis and, the smallest antelope in the region, the Suni Antelope. 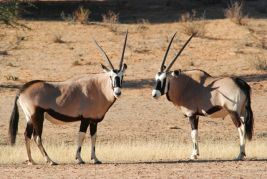 There are groups of Oryx all over the place and the shy Springbok are always in the shade of the acacias. 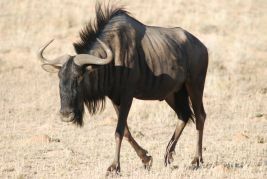 Wild Gnu, called Blue Wildebeest, and the silver “Saddle-clothed Jackal”. This cat isn’t very friendly, although it might appear to be a domestic cat. 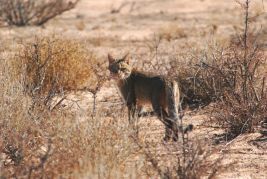 It is the Wild African Cat. 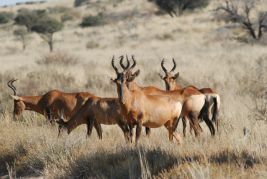 The Red Hartebeest are here (antelopes with heart shaped horns), red in colour with a light coloured back. 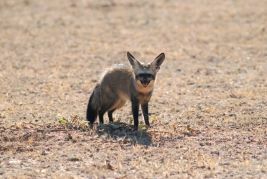 There are also the long-eared foxes, called the Bat Eared Foxes. They are difficult to find during the day. And then… We finally get to meet his majesty! 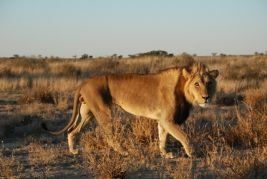 This Kalahari lion has made us wait a good three days! 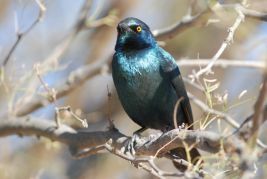 We thought we were not going to see him, but on the last evening as we were taking the road out to Namibia, we encountered three groups of them. 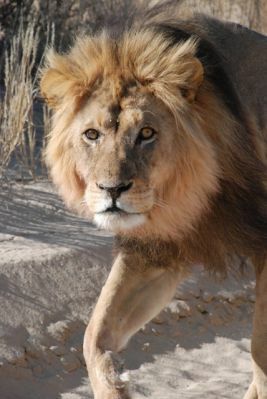 This one, with his dark mane is characteristic of this desert.